Urinary tract infections (UTIs) are incredibly common and result in millions of visits to doctor’s offices every year. At 180 Medical, many of us not only have first-hand experience with urinary tract infection; we also frequently talked to customers who have trouble with recurrent UTIs. One of our goals at 180 Medical is to provide you with the information you need to turn your health and life around. We’ve prepared this educational infographic about Urinary Tract Infections. This should give you more information about symptoms, prevention, and care tips. If you believe you have a UTI, contact your doctor to schedule an appointment as soon as possible. Then you can begin treatment and get well. 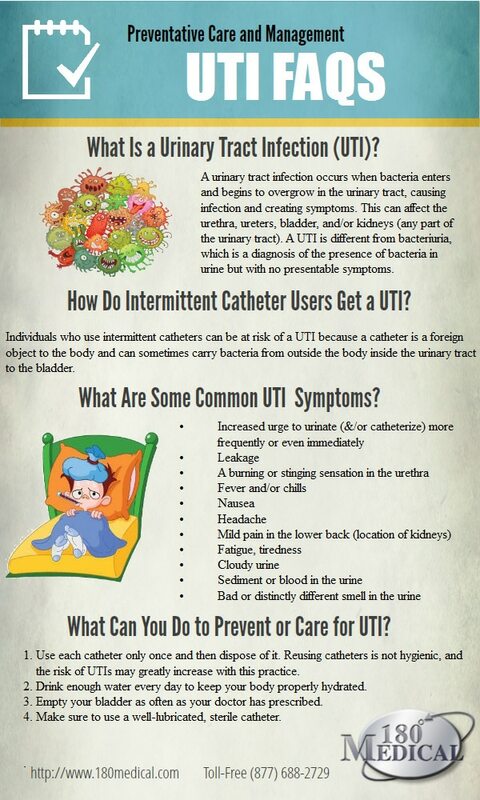 If you use catheters and have recurrent UTIs, give us a call at 1-877-688-2729. Together, we can discuss your options for products which may help to reduce the risk of UTIs. National Hand Washing Awareness Week: Are You Washing Your Hands Correctly? Do you know how to properly wash your hands? The answer might surprise you. Find out more about the importance of hand-washing. Have you been told it’s okay to wash and reuse your intermittent catheters? You may have the wrong advice. Find out the number one reason to never reuse your catheters in our latest blog! Are you experiencing recurrent urinary tract infections as you use intermittent catheters? Check out some of our top tips for UTI prevention!